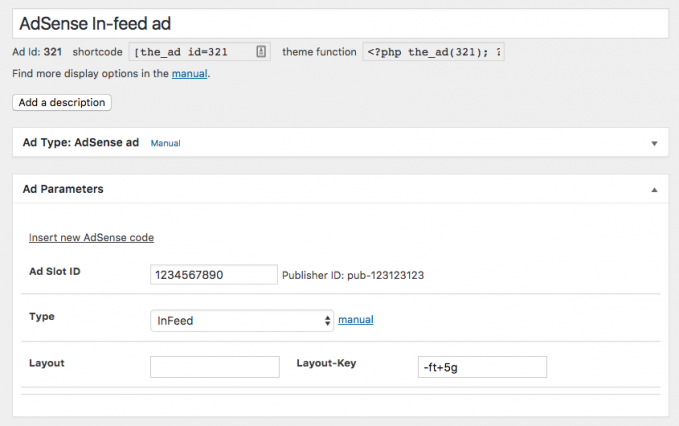 In-feed ads are dedicated AdSense ad codes which you can place within lists of posts. While you could do this with the default content ad units as well, In-feed ad units come with a new layout and more options. I guess that together with the In-article ads they are going to replace the current display ads format. 3.1 How many In-feed ads should I place? 3.2 Where can I place an In-feed ad? 3.3 When is the AdSense In-feed visible? Follow these steps to create a new AdSense In-feed ad in your AdSense account. 1. Log in and go to My ads > Ad units and click on New ad unit. 4. Now choose the format. For desktop sites, I would choose one of the formats with the image on the left and text on the right side, while on smaller layouts the image at the top and text at the bottom might work best. You can later test other layouts as well. All the other options are more or less helping you to adjust the ad layout to your site. The more experienced you are with your ad setup, the more you can experiment and also run tests later. You can click on I’m done now and move to the implementation of the ad code into your site. The ad code is now stored in the clipboard on your computer. You could also save it in a .txt file if you don‘t intend to go to the next step right away. Once you have the AdSense Infeed ad code, you need to place it between posts. Most websites not only list those on their homepage but also have archives by category or author. Our free AdSense In-feed plugin can help you place In-feed ads to your WordPress site without any coding. Just install the basic version of Advanced Ads and this add-on. After you installed Advanced Ads, go to Advanced Ads > Ads and click on New Ad. Enter a title for your ad – it is only visible to you. Select AdSense ad in the Ad Type box. Paste your AdSense code into the textarea in the Ad Parameters box. Now you define where the ad should show up. Advanced Ads separates content (ads) and positions (placements) to make you more flexible when it comes to rotating or replacing ads. Go to Advanced Ads > Placements. If you already have placements then click on New Placement below the placement list. Choose the AdSense In-feed placement type with the following icon, enter a name for the placement and select the ad you want to display. After you saved it, search for the new placement in the list. Here you can select before which post in the frontend the ad should show up. The example below would show the ad between the first and second post on the homepage and other archive pages. You can repeat these steps with different placements if you want to place an ad between multiple posts and not just at one position. The ad code could be the same, but if you want to test at which position In-feed ads work best, then I would suggest using different ad codes. You can later go to the performance report and analyze the individual revenue. How many In-feed ads should I place? AdSense does not suggest a specific amount of In-feed ads on your WordPress site, but there is still some limitation. There shouldn’t be too many ads too close together. If you have long and full posts on your archive pages, then you could place an ad between all of them. If you show only short excerpts, then I would not recommend to place an ad before every post. Our tests also have shown that the ads before the first articles perform best and very often ads before the bottom posts perform only very little or not at all. Save your site some bandwidth and don’t place more ads there. Where can I place an In-feed ad? You are allowed to place the ad above, below or within the list of posts, but not in your sidebar or the header next to your logo. When is the AdSense In-feed visible? Like with all new AdSense ad units, it might take up to 30 minutes until the ad is showing up on your site. With new accounts, it might even take a bit longer. Would you like to put not only AdSense In-feed ads between posts? In this case, check out the Post List Placement. It works with all kinds of ads.